1. Place honey, grated lemon peel, ground pepper, garlic powder and hot water in a small bowl and whisk until blended. 2. With gloved hands, rub mixture over salmon fillets. 3. Heat olive oil in a skillet over medium heat. 4. 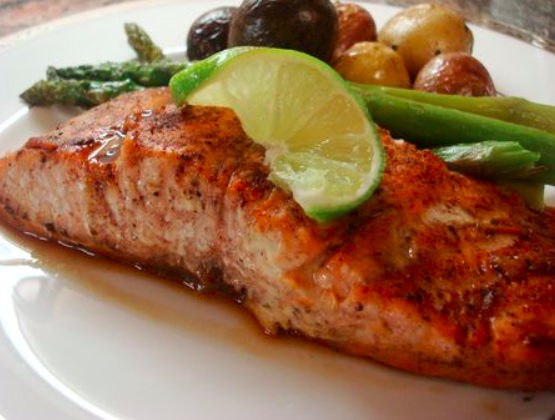 Add spice-rubbed salmon fillets and cook 4 minutes. 5. Carefully turn fillets with a spatula. 6. Reduce heat to medium-low and cook an additional 4 to 6 minutes, until fish turns opaque throughout and flakes easily when tested with a fork. 7. Arrange 1/2-cup arugula on each plate. 8. Place salmon fillet on top of arugula and garnish with a sprig of fresh dill.